The favorite is the horse with the lowest odds or the one on which the most money has been wagered. Favorites win approximately one third of the time. This is not necessarily a sound wagering strategy as the payout for favorites are relatively smaller. 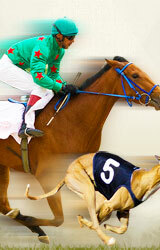 Tip sheets are prepared by professional handicappers and may provide useful wagering selections. Tip sheets are readily available at your favorite track. 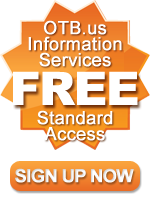 Many online horse racing betting sites also offer tip sheets. Watch the broadcast signal while the horses are in the paddock and in the Post Parade. Class is difficult to define, but it is unmistakable at the racetrack. Horses seem to sort themselves into competitive levels. "Pace makes the race." This old racing expression points to another element to consider when placing your bets -- the pace of the race. A horse generally can't have it both ways. That is, he can't run extremely fast early and still have enough left in reserve to run fast late in the race. A fast pace generally means that the horses on the front will tire out, thus helping the runners that are closing ground. If the past performances indicate that there are several speed horses in a race, it might be a good idea to consider a horse that likes to rally in the stretch. On the other hand, a slow pace will help the horses near the front because they should have something left for the end of the race. In studying the past performances, you might find only one legitimate speed horse in a particular race. If that horse gets loose on the front end and has the pace all to himself with no pressure being applied to him, he figures to have something left for the homestretch and should be hard to overtake. It's always wise to take into account the human factor. Some trainers do well with 2-year-olds while others are particularly adept with horses shipping in from long distances. Some jockeys seem to ride better on the front end, and others are better known for their come-from-behind style. A good idea is to check the standings, which show the leading trainers and jockeys at the meeting. Blinkers are used on horses to limit their vision and to prevent them from swerving from objects or other horses. It's worth noting changes in blinkers - a horse wearing them for the first time (or for the first time in a number of starts) or racing without them for the first time. Mud calks are used for off tracks. Calks, pointed extensions or cleats on a horseshoe, are designed to prevent a horse from slipping. Certain other equipment worn by the horses is noted in the past performances. It is important for a bettor to watch his horse during the running of the race and again on the replays after the race to observe what kind of trip he had. Was the horse squeezed back at the start, or carried wide on the turn, or blocked at the quarter pole? A horse that loses a race because of a troubled trip might be a good bet in his next start. 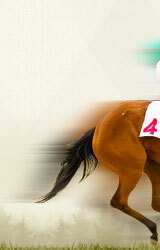 Usually trouble encountered by a horse in a race is shown in the past performance lines. Weight, the old saying goes, will stop a freight train, so it's especially important to notice when horses are carrying considerably more weight than they did in their last start. Conversely, it's just as significant to watch for horses that are carrying much less weight than they did in their last outing. One theory is that weight plays a bigger role in long races, but another line of reason is that weight is every bit as important in sprints. Breeding is an inexact science, but a careful study of pedigrees can enhance a bettor's chances at the races. Some horses are bred for speed, others have inherited stamina from their sires and dams and are able to run long distances and certain horses are bred for grass racing. Condition may be the most difficult handicapping factor to master. It is defined as the fitness of a thoroughbred - how prepared he is to run a particular race. The dates of the horse's most recent workouts and races and the probable effects of this activity on his current condition are highly important. If a horse is racing for the first time in a month or so, a steady pattern of workouts is a good indication of fitness. A good time for a workout generally is when a horse covers the distance in 12 seconds or less for each furlong - 36 seconds or less for three furlongs, 48 seconds or less for four furlongs, etc. A "short" horse is one not trained up to the last ounce of his energy and thus not fit enough for the race he's running in. He'll tire, and his stride will shorten before the end of the race. Lasix and Butazolidin are medications administered to racehorses. Lasix, a diuretic, is used to control bleeding (certain horses bleed from a ruptured vein - or veins - in the nostrils, the pharynx or the lungs), and Bute is an anti-inflammatory medication. Some handicappers pay close attention to a horse racing on Lasix or Bute for the first time, believing that these medications might enhance that runner's performance.